We are seeking practical people to try and build a dome unit at low-cost and perhaps invest in portable digital systems, as well. The Science Dome is an independent distributor for the Digitalis Education Solutions. We want to help find the right solution and also help with free software and building a permanent dome in a spare room/space. You can also purchase a mobile inflatable dome as an alternative. Projectors supplied are the most advanced mobile projectors in the world with state of the art Nightshade and Stellarium software. This can also be downloaded and used on a PC desktop for a test. Visit the link below. 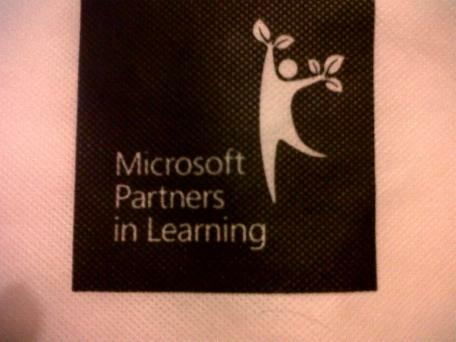 The Worldwide Telescope is another planetarium system developed by Microsoft Partners in Learning. 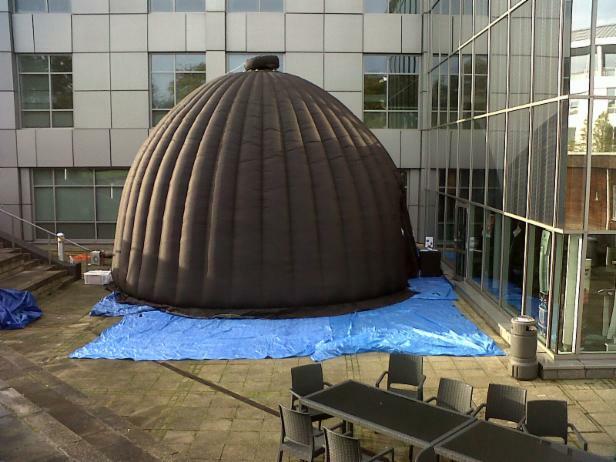 The UK Partners in Learning invited the Science Dome in Nov 2011 to support a demonstration of WWT. 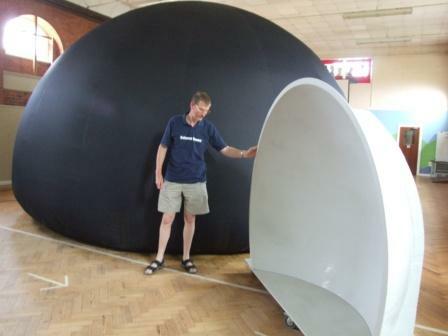 Here are some pictures of the event with our unique Outside dome (for hire)-- we are now promoting to schools and universities, a Self Built Dome from the WWT website for constructing a fixed planetarium in a small room or hall for school to attempt and perhaps invest a portable digital planetarium systems, as well. 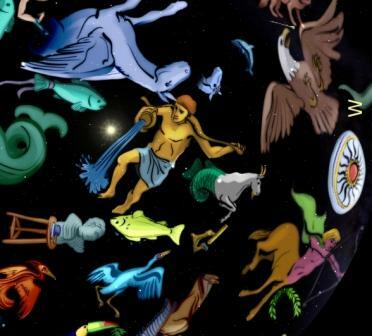 The planetarium provides schools and other groups with a great way to visualize the panoramic view of the universe provided by WorldWide Telescope. The planetarium described here is just under 12.5 feet in diameter, and just over 9 feet tall. So the first step is finding a suitable location for it! The materials used are not suitable for an outside location, so the location should be inside, level and dry. Alternative measurements are given for a smaller (9 feet diameter) planetarium, though all the images in this document are for the 12.5 feet model. Measurements are given in inches as this is the most used unit for packing materials and particleboard, which are the main construction materials used - 48 inch wide corrugated cardboard, and 48 inch wide particleboard paneling are both easy to come by. We supply rigid domes for projection either all surround 360 degree domes OR surround horizontal screens. Domes are made of fiberglass and have a special smooth projection surface.